Built Up Roofing - San Diego Roofing Inc.
Built-Up Roofing (BUR) is one of the oldest and most reliable and durable commercial roofing systems for buildings with low-slope or “flat” roof structures. Often referred to as “tar and gravel” roofs, BUR consists of multiple layers (plies) of roof felts laminated together with bitumen or asphalt. 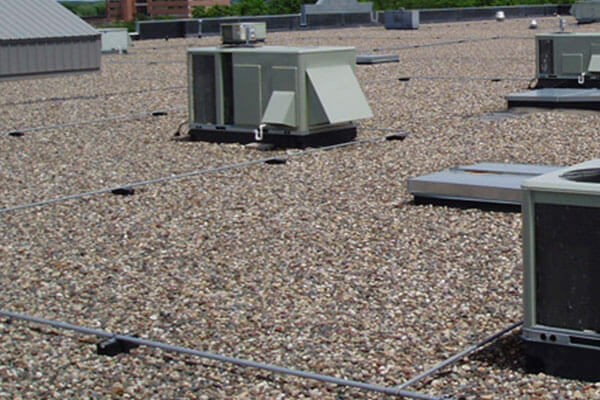 BUR consists of bitumen-saturated organic-fiber, fiberglass, or polyester felt with a top-surface of asphalt, aggregate (gravel or slag), fiber, or non-fiber coatings engineered for roof coating, or a granule-surfaced cap sheet. Built-up roofs can be designed and specified to meet a broad range of building waterproofing applications, depending on the needs of the building owner. BUR is especially resistant to damage from wind, hail and snow. They are easy to repair and ideally suited for applications requiring a high level of redundancy. BUR surfacing materials can be coated with paint or other reflective materials to reduce the effects of UV radiation. These coatings provide the additional benefit of reducing cooling and heating costs.